This issue focuses on a range of topics, including one of our practices being rightly rewarded for its excellent work with young people and some of the work we are doing to support people to look after themselves the with 'a better u'. We are also delighted to launch the integrated health and social care community teams across South Tyneside following a very successful pilot period. By working together in a completely integrated way we can provide more patient-centred care, which means better continuity of care, ease of access and more efficient use of the resources we have. Feedback from patients and staff so far has been overwhelmingly positive. A new approach to delivering health and social care has been launched across South Tyneside after proving a hit during a pilot phase in Hebburn and Jarrow. A partnership of NHS South Tyneside Clinical Commissioning Group (CCG), South Tyneside Council and South Tyneside NHS Foundation Trust is working together with local community and voluntary groups to integrate community teams across the borough. 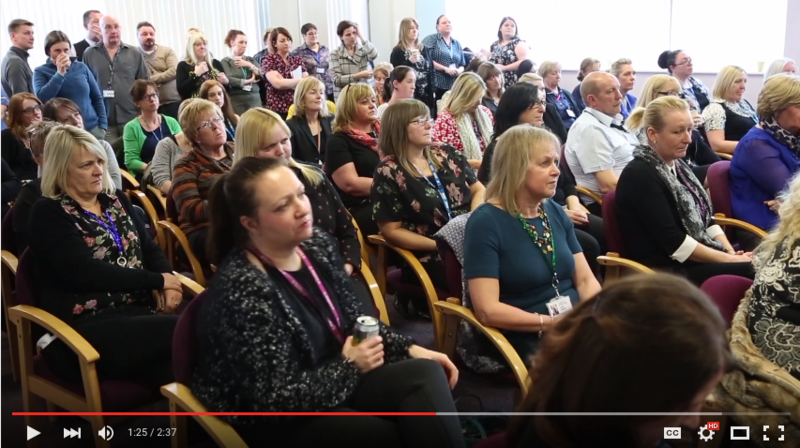 Neighbourhood teams made up of district nurses and community matrons from South Tyneside NHS Foundation Trust and South Tyneside Council’s social workers will work more closely together with local general practices to deliver seamless services to local people. There is also a social navigator working with each of the teams, employed by a local voluntary sector organisation, to help people access wider support available in the community. The launch event included members of the team sharing their experiences of the new approach presentations showcased how it is making life easier for people to access the care and support they need to help more people to stay well in their own home. The team has been praised by one woman who needed immediate help and advice when her mother became ill.
Mrs Maria Power, 59, who has multiple sclerosis, has lived independently in her own home in Hebburn but needed to be admitted to hospital earlier this year with a urinary tract infection. When she came home, she was unable to care for herself or be left alone. Her daughter, Nicola Bamling, 32, said: “My dad and I care for her but we both work so we needed advice really quickly. I called the district nurse who has been seeing my mam on a weekly basis for years and she sorted everything out. Social workers were able to give the family immediate advice on how to find a carer while occupational therapists are investigating ways that Mrs Power can use mobile technology to enhance her independence. District nurse Maria Purdy, who is Mrs Powers’ care co-ordinator, said: “I’ve worked in district nursing for 27 years but I’ve never worked in such an integrated way before. By working together we are able to serve the local community so much more effectively. Talbot Medical Practice has become the first to receive South Tyneside Council’s Change4Life young person’s quality mark, accrediting the way a setting engages and communicates with young people. The quality mark is based on the Department of Health’s national programme, Your Welcome, and involves young people conducting their own inspection. Youth inspectors complete their own inspection, alongside a desktop evaluation and which includes interviewing key staff members. Some have specialist areas for instance so it’s the young people that ultimately decide if the setting is successful. The practice provided a portfolio of evidence, based on areas such as access, how healthy lifestyles and other practice initiatives were communicated with young people and how the practice works with young people. This portfolio also included information on staff training and how young people’s views can influence service provision. Dr Sharmila Parks said: “We worked with a team of young people, aged 11-19 who devised and conducted surveys. We’ve implemented a host of changes after receiving the initial feedback. “Young people were key to helping us make these improvements and were involved throughout the improvements. With their help we modernised the waiting room and created a dedicated area for young people with specific information for their age group. “We also linked up with St Wilfrid’s R.C. College and we now have photography of local landmarks taken by the pupils displayed in the waiting room. “Reception staff worked with young people to help them understand what issues they face. The National Mental Capacity Act Day of Action was held on 15th March and promoted a wider understanding of the Mental Capacity Act across health and social care. 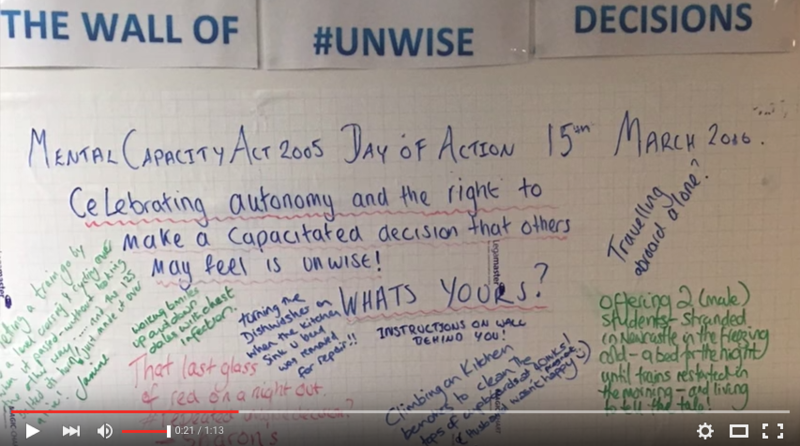 The CCG is working hard towards embedding this person centred Act across the health community and supported the day of action by being represented on the day in London at the national event and getting involved at home with this ‘wall of unwise decisions’. Click here or below to play video. The wall highlighted unwise decisions that staff have made and prompted them to think were they 'questioned about their choice?'. Being able to make your own mind up on decisions is a key principle of autonomy. It promotes our individuality and affects our successes and failures. The wall of unwise decisions was a way of highlighting this ability for us all to make decisions, whether they be in our best interest or not. Staff shared some of their unwise decisions, which were shared on social media under the #unwisedecisions hashtag on Twitter. 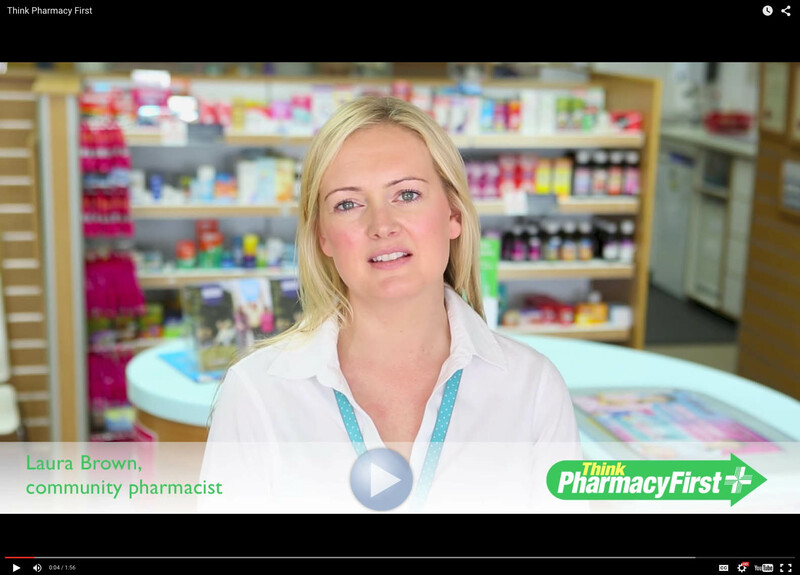 A campaign to encourage local people to take advantage of free, expert health advice from their local pharmacy and help ease pressure on hospital services has seen over 9000 consultations from April to October, two thirds of which have been for under 18s. Click here or below to view video. Self-care courses are available to residents and we are working with our local community to strengthen and raise awareness of support and activities available to people in their local area The a better u programme also includes developing new ways to support people with long-term conditions to have a greater role in managing their condition. We know that people who are active and motivated around their health issues have a better chance of staying healthier for longer. For more information, or to register your interest to get involved, please visit our website at:www.southtynesideccg.nhs.uk/get-involved/my-nhs . You can also call 0191 217 2670 to join. South Tyneside Clinical Commissioning Group would like to gather experiences from patients and carers about current Chronic Obstructive Pulmonary Disease (COPD) services for South Tyneside residents to help inform ongoing work in this area; COPD includes chronic bronchitis and emphysema. The CCG would also like to gather experiences about services for cardiac failure patients in South Tyneside. If you are a patient in receipt of current COPD or cardiac failure services, or a relative or carer of someone receiving either of these services, and would like to share your experiences please contact Helen Ruffell on helen.ruffell@nhs.net or telephone 0191 2831903. Stories are confidential and are only shared with colleagues in the CCG and with partners with the patients' or carers' permission. Bowel cancer is the second biggest cancer killer in the UK. However it shouldn’t be because it is treatable and curable especially if diagnosed early. For more information go to bowelcanceruk.org.uk or social media accounts - Twitter - @Bowel_Cancer_UK and Facebook charityBCUK.